In an earlier post, we looked at why ground subsidence has become such as serious problem in Mexico City. The uneven subsidence poses a major challenge for engineering projects such as constructing (and maintaining) the city’s metro system. The Mexico City metro has 11 lines linking 175 stations, with a total length of 201 km (125 miles); an additional line is under construction. The metro is used by 5 million passengers a day. Some parts of the system are overground, but 56% of the network is underground. The deepest station is 35 m below street level. The Mexico City metro is the 7th most widely used in the world, after the metros in Tokyo, Moscow, Seoul, New York, Paris and Beijing. When the first line was built in 1969, one of the strategies adopted by engineers to limit damage from subsequent subsidence was apparently to build the metro tunnels and stations in such a way that their total weight was very similar to the weight of the mud and sediments removed during construction. Presumably, if the weights were identical, at least the tunnels would be likely to remain in the same relative positions over time, even if the subsoil contracted and sank. To a large extent, the engineers were successful, and the metro has experienced amazingly few structural problems in its 41 years of operation. 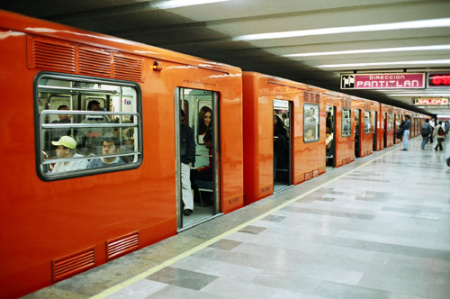 In the devastating 1985 earthquakes, Mexico City’s metro system sustained no serious damage despite the widespread destruction and loss of life above ground. Mexico City’s metro network is administered by the Metro Transportation System (Sistema de Transporte Colectivo Metro, STCM). STCM ackowledges several recent problems related to small-scale earth movements on five of its eleven lines: Lines 4, 5, 9, A and B. For example, the maximum permitted velocities for metro trains were reduced for the section of Line A between Pantitlán and La Paz while repairs costing 36 million dollars were completed. Even as STCM undertakes the necessary repair work, it is starting to install a state-of-the-art, 1.6-million-dollar fiber-optic monitoring system which will eventually cover the entire network. The system enables the “real time” detection (with live video feeds) of any subsidence, fissures, inundations or related issues. Why does the metro system have a much higher density in eastern and southern Mexico City than in the northern and western parts of the city? Chapters 21 and 22 of Geo-Mexico: the geography and dynamics of modern Mexico analyze Mexico’s 500-year transition to an urban society and the internal geography of Mexico’s cities. Chapter 23 looks at urban issues, problems and trends. To preview more parts of the book, click here and use amazon.com’s “Look Inside” feature; buy your copy today! I am really interesyed in who designed and constructed this amazing metro line, originally? Were they Mexicans, Americans? I never see names of people or companies. Can you tell something about the companies and people behind this immense project? Update: The person usually credited with pushing the idea of building a Mexico City Metro system is engineer Bernardo Quintana, who was in charge of the Mexican construction firm ICA (Ingenieros Civiles y Asociados). The design and construction of the first stage (1967-1972) was coordinated by Mexican architect Ángel Borja; individual metro stations were designed by a large number of people, advised by such experienced architects as Enrique del Moral, Félix Candela, Salvador Ortega and Luis Barragán. What questions were asked in Mexico’s 2010 population census? Which states in Mexico have the highest infant mortality rates?